Consumers who really want confidence in a vehicle’s driving ability in all-weather conditions choose all-wheel drive (AWD) vehicles. When wants and needs (and preferences) dictate an AWD SUV, there are a number of very good selections available in the used market. For this list of the top three Best Used AWD SUV vehicles, we’ve gone back to the automotive experts. Check out these three AWD models and see what you think. Subaru Tribeca – Automaker Subaru has spent more than 40 years perfecting what they market as “symmetrical all-wheel drive.” According to Subaru, the “design keeps power routed to all four wheels and keeps the vehicle exceptionally balanced for poise and tight handling.” Consumer Guide comments that “Tribeca’s ride is absorbent, stable, and well-controlled over most surfaces,” although “it’s not an especially quiet vehicle, and its interior design and materials may turn off shoppers.” U.S. News and World Report gives high marks to Tribeca’s standard AWD, new powerful engine, attractive and functional interior and good ride and handling. Tribeca is also a Top Safety Pick of the Insurance Institute for Highway Safety (IIHS) for 2007 to 2010. Tribeca, a midsize SUV, was redesigned in 2008. 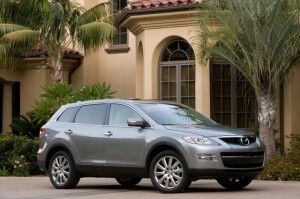 Mazda CX-9 – Motor Trend says this of the 2007 Mazda CX9 large SUV, available with AWD: “Over a wide variety of road surfaces the CX-9 was supple and quiet…and it cornered much flatter than an equivalent minivan might, with a nice build-up of forces at the steering wheel.” Car and Driver hails the engineering work in the 2008 model that “yielded a unibody that’s arguably the best in its class for structural rigidity, which, in turn, yields benefits in ride and handling, two of several areas where the CX-9 gets high marks.” Consumer Guide gives the 2009 CX-9 a Best Buy nod, saying it’s a “stylish, refined entry that adeptly balances solid driving dynamics with generous passenger and cargo room.” And Autotropolis names the CX-9 as one of the Top 2009 AWD Vehicles. Ford Flex Limited – Flex, from Ford Motor Company, is a midsize combination crossover and SUV that offers room for seven passengers, an edgy design, lots of standard features, and it’s also fun to drive – say aficionados of the model. Flex rides on the same platform as the Ford Taurus and the Volvo XC90 and is available in front-wheel drive (FWD) and AWD. Autotropolis places the 2009 Ford Flex in its list of Top 2009 AWD Vehicles and Consumer Guide says it merits a Recommended pick. 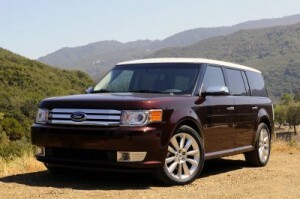 IIHS named the Ford Flex a Top Safety Pick for 2009 and 2010. Other possibilities for Best Used AWD SUV include Acura RDX AWD, Ford Escape AWD, Honda CR-V AWD, Nissan Rogue AWD, Subaru Forester AWD, and Volkswagen Tiguan AWD.